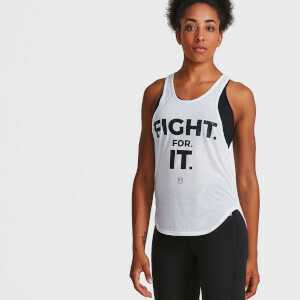 I wore this tank during my workout last night and I loved it! It's super soft and looks super cute tied and untied. I love how I can wear this tank tied or untied! If I want it to be loose and flowing I leave it untied and if I need it out of my way for a work out I can just tie it up. And who doesn't want to fell FIT and FIERCE! The fabric is nice, very soft and lightweight. I'm going to buy the black one too!